This week Deadline & @Frank151 decided to join forces and release an exclusive snapback collab limited to only 151 pieces, officially dropping today. 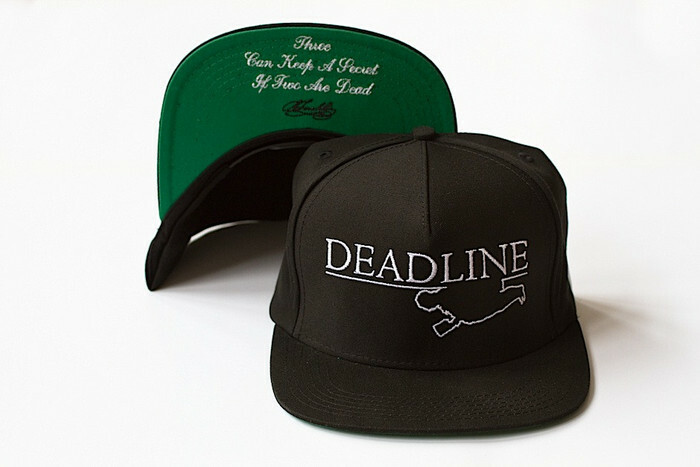 Combining the classic Ben Franklin logo and Deadline’s signature crime scene silhouette and coupling them both with “Three Can Keep a Secret if Two Are Dead” embroidered under the brim, it’s a perfect merging of the minds to add to your collection. And what better way to promote the drop than a quick teaser featuring infamous NYC character and Deadline’s own mastermind, NA? Shot at a bodega on Mulberry Street in Soho, the one-minute short also features cameos from Neal Santos and Wes Spotts, who play two homies looking to get served the goods by their boy (NA) behind the counter. Oh, and big ups to Uncle Paulie on his directorial debut! See the trailer and snapback information below!